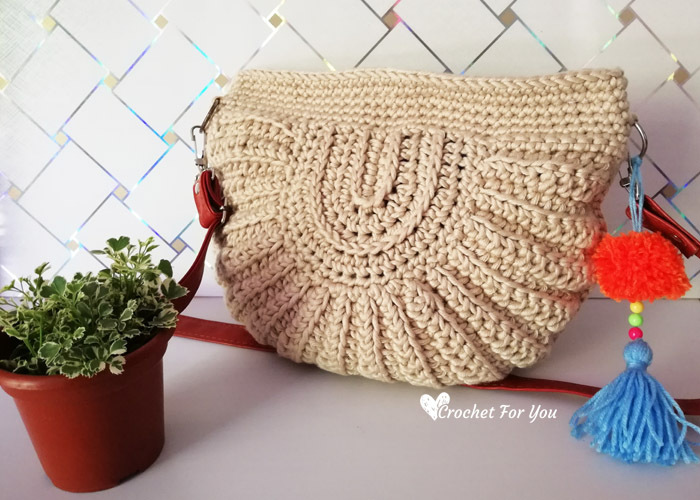 Crochet Seashell Bag Pattern by Crochet For You. 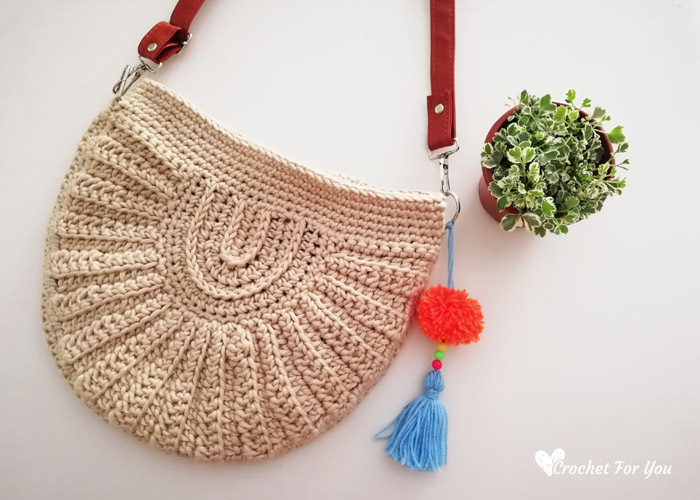 Can you believe this is my first time I crocheted something just for me in this year? Yes, it is a half circle bag. 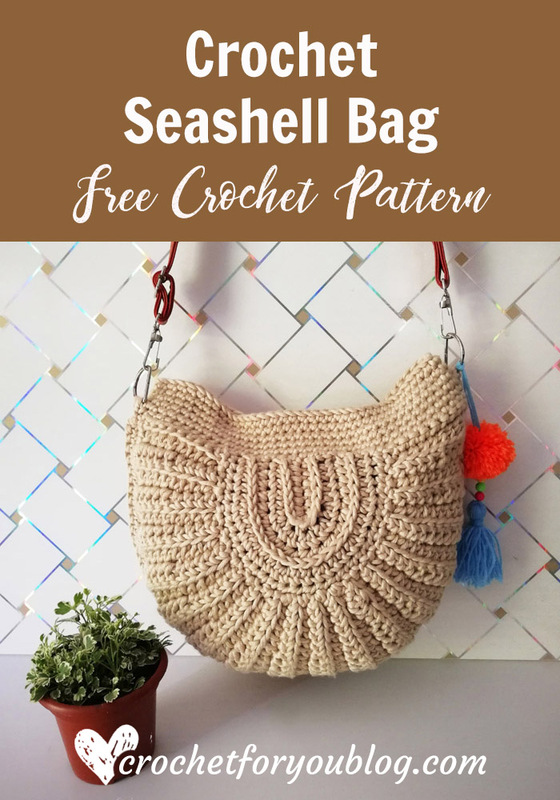 😀 And I really wanted to share the pattern with you so everyone can make your own crochet seashell bag. 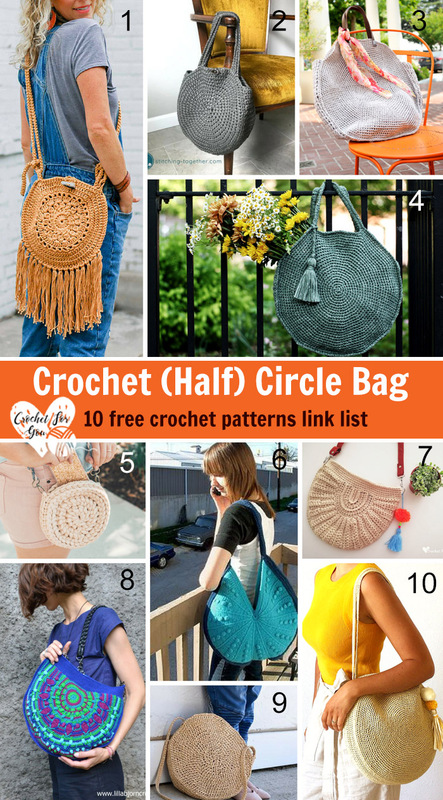 You know crocheted circle bag is very popular right now and there are so much beautiful circle bag patterns can be seen everywhere. 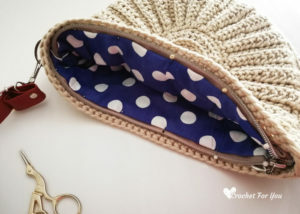 When I was looking at them I really.. no badly need my own circle bag. 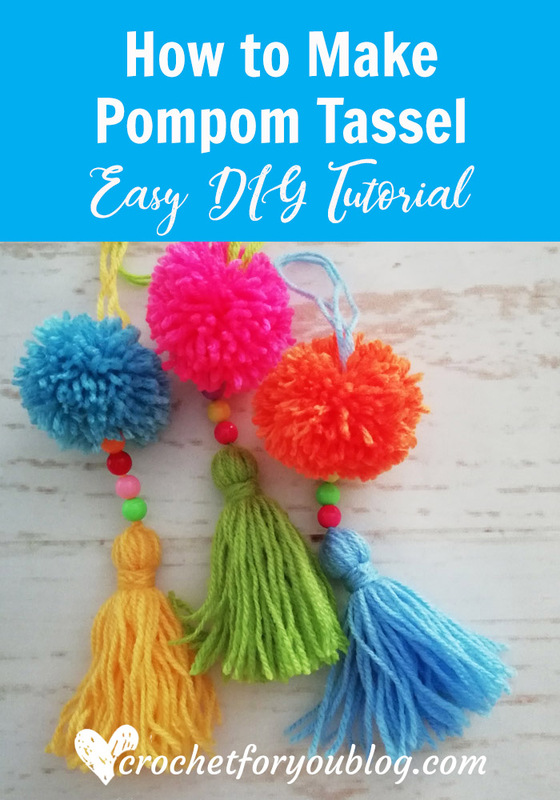 So I grabbed the hook and one and only yarn ball I had with the straw/raffia-like color and started to crochet the pattern in my mind. 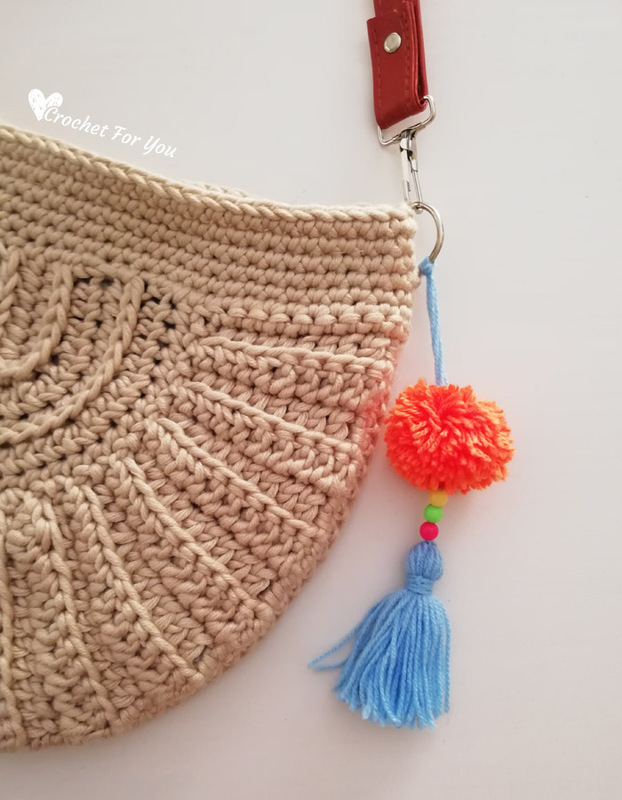 Just because I wanted to make straw-like circle bag, I used the same yarn and color I used for the crochet straw sun hat. 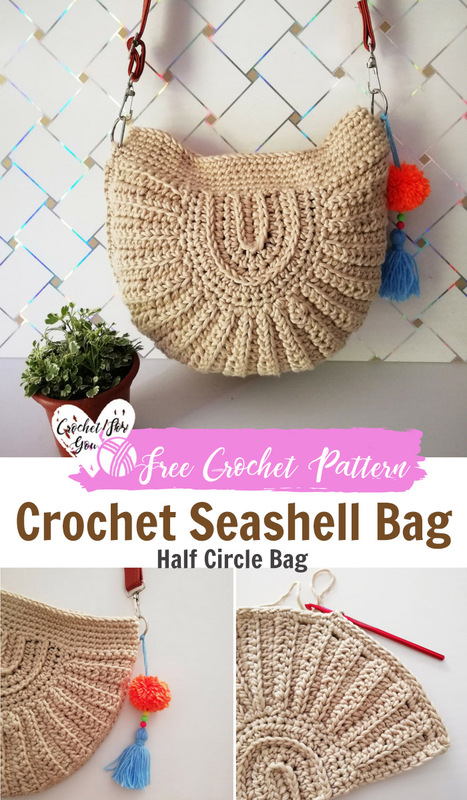 This crochet seashell bag made by joining 2 half circles together. 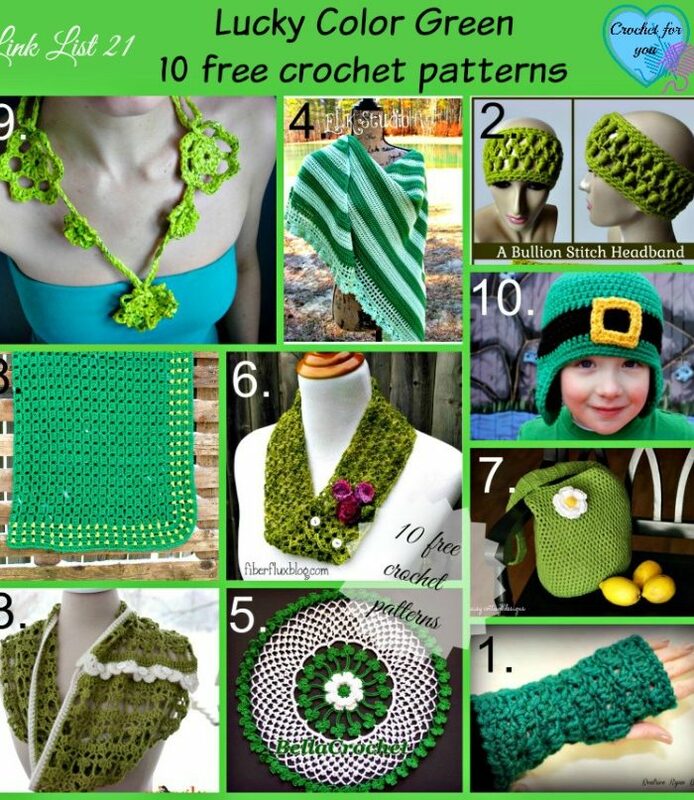 Each half circles have 2 parts to crochet. 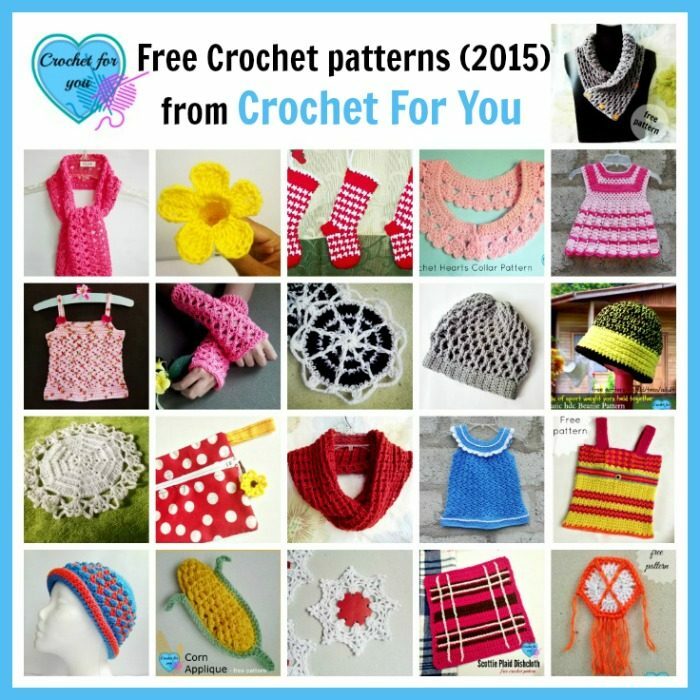 The pattern looks little complicated but it is so easy to crochet than you thought. The bag has a nice texture, too. 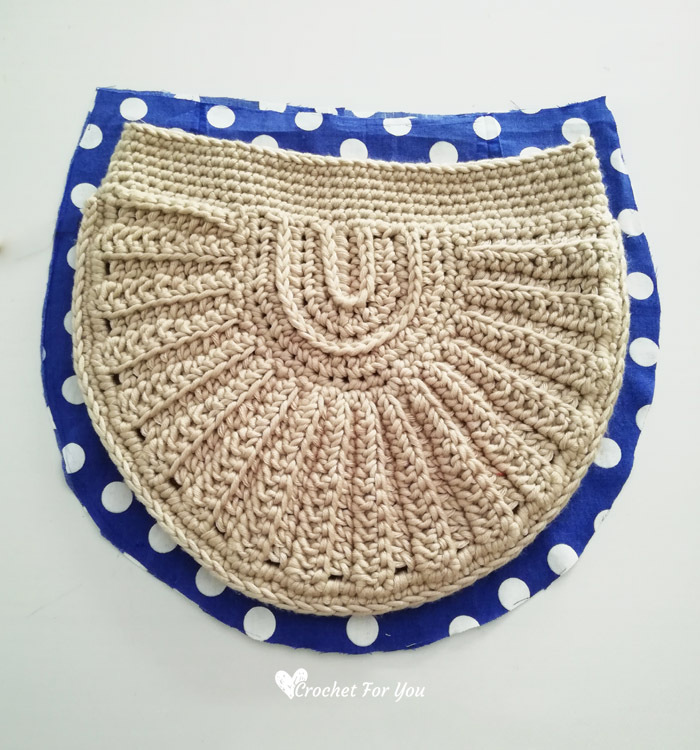 This is a medium size bag you can carry out with your essentials. I used the strap with lobster clasp from another bag I had a long time ago.. 😀 I always keep useful little stuff before something throws away. 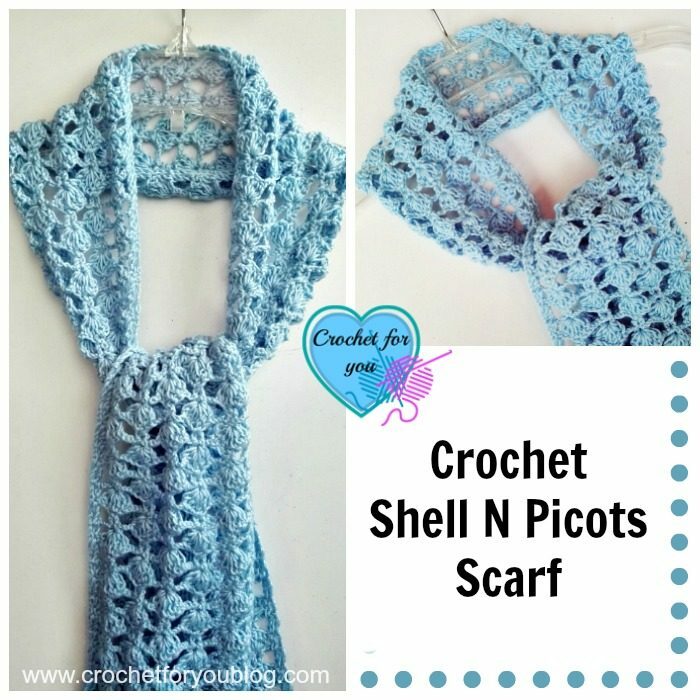 Isn’t it a great idea just for us as a crochet/craft lover? 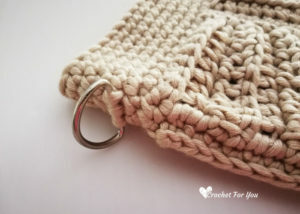 We can use those little things on our handmade stuff. 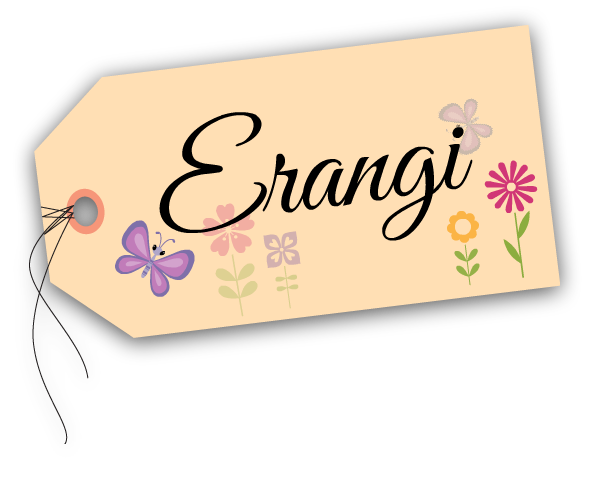 Finished size: 11″ height x 11.5″ wide. Lining Piece Approx: 30″ x30″, needle and thread for the lining. hdc2tog = [Yarn over, insert hook in BL of next stitch, yo, pull up a loop] 2 times, yo, pull back through all the loops on the hook. 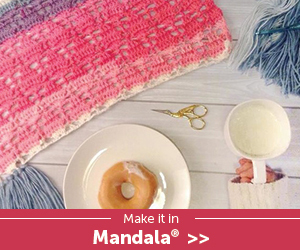 First, you need to crochet center of the half circle. Start to crochet next part around the center of the half circle. Row 5: (RS) ch 1, sc in first st and each of next sts across, do not cut the yarn, crochet ch 10 to start next part. Turn the work upside down. Row 4 to 7: repeat row 2 and 3 continuously. Row 19 to 20: repeat rows 17 and 18. Row 21 to 22: repeat rows 17 and 18. Row 33 to 34: repeat rows 31 and 32. Edging: ch 1, (RS), crochet sc in around evenly. I crocheted 67 sc sts around. Fasten off and weave the ends. hold 2 pieces together facing the wrong side (WS) each other, insert hook into first st in both pieces, ch 1, sc in same sts, sc in each sts around the curved edge until last st. (67 sts total around the curved edge.) Fasten off and weave the ends. Round 1: Start in one of the corner, crochet sc in around the top of the bag evenly. 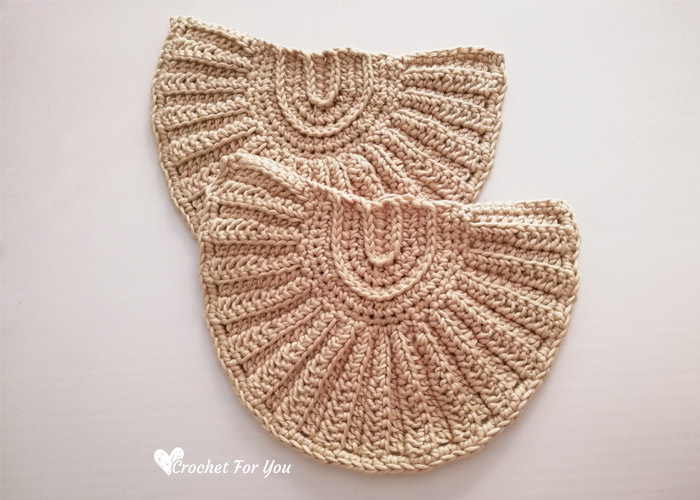 I crocheted 36 sts total in each half circle. 10 sc sts in one side of part 2 of the half circle. And 16 sc sts in the center part. Again 10 sc sts other side of the part 2 of the half circle. After crocheting around the bag, sl st to the first st. Totally you will have 72 sts around the top of the bag. Round 3 to 6: repeat round 2. Fasten off and weave the end. Sew zipper and lining to the bag. 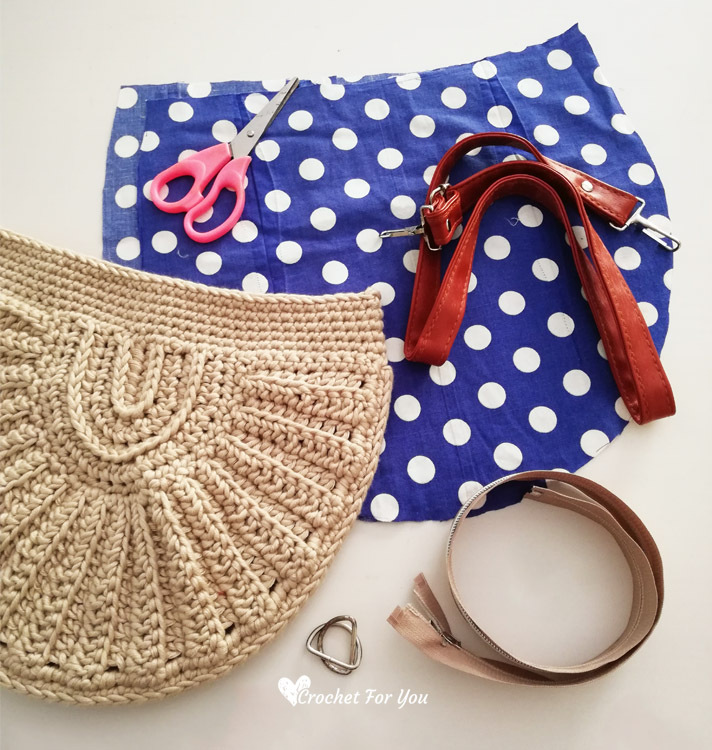 Cut two pieces of the lining to your bag by leaving 1” for seaming. 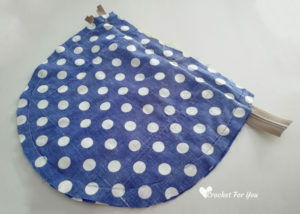 I simply laid the bag on the lining piece and cut the 2 pieces by leaving 1” for seaming. 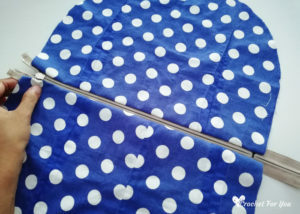 And mark a straight line on two pieces of lining on the open side just 0.5” below at the opening side of the bag (those lines will help you to sew the zipper to the lining). 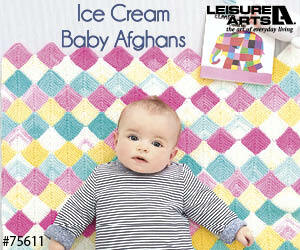 It is a thick shiny yarn called “Malai dora”. I love your bag. I think it is beyond my crochet skills, but it is so original.